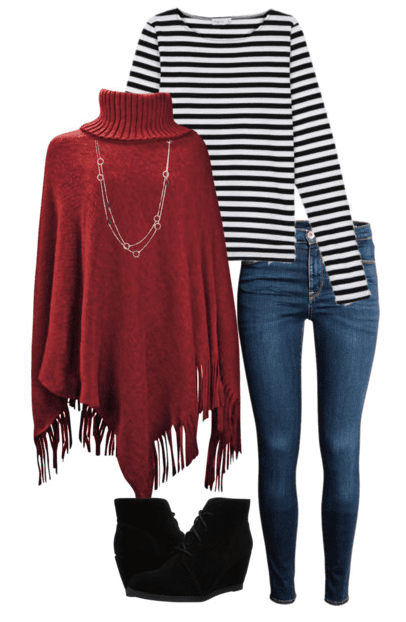 Do you need a stylish outfit in a flash? You can’t go wrong with a burgundy poncho and a black and white striped shirt. 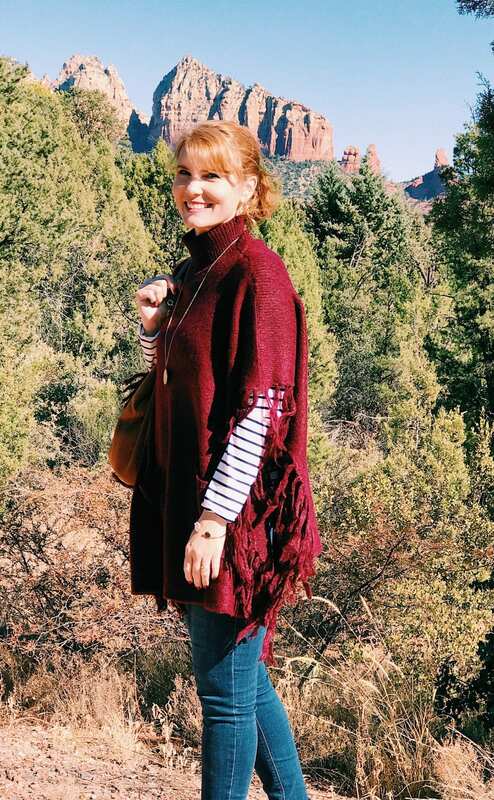 Hello from beautiful Sedona, Arizona! My family and I are spending our Thanksgiving holiday here at a local RV resort. This is definitely one of the most unique Thanksgivings we’ve ever celebrated. We knew that traveling full-time meant holidays away from family and familiarity. It’s both bittersweet and exciting. We’re missing family, but we’re also getting to experience something new. The RV resort we’re staying at is hosting a Thanksgiving lunch. They’re providing the meats and everyone else brings sides and desserts. Which means I get to try my hand at whipping up sweet potatoes and a dessert of some sort in an RV. This should be interesting! Wish me luck! 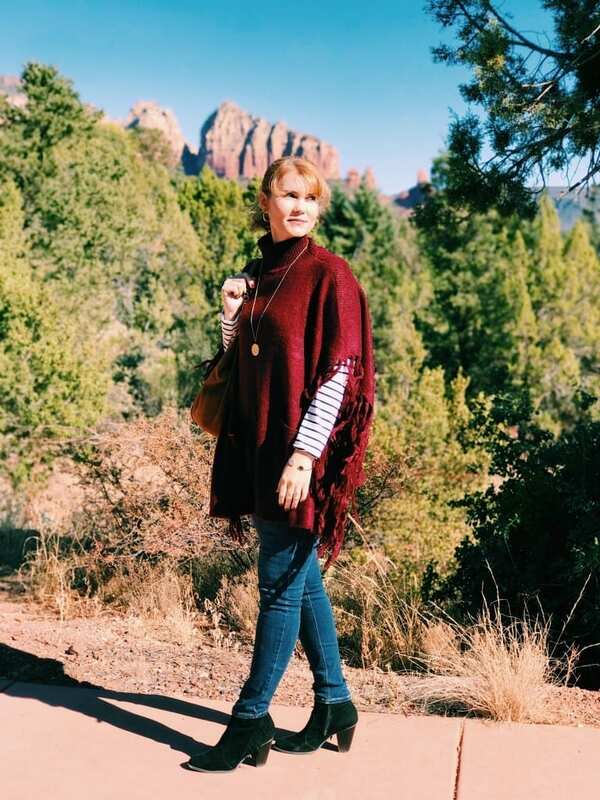 For some reason, I left all of my cute ponchos in storage back in Texas and it’s one of my favorite items of clothing to wear in the fall and winter. 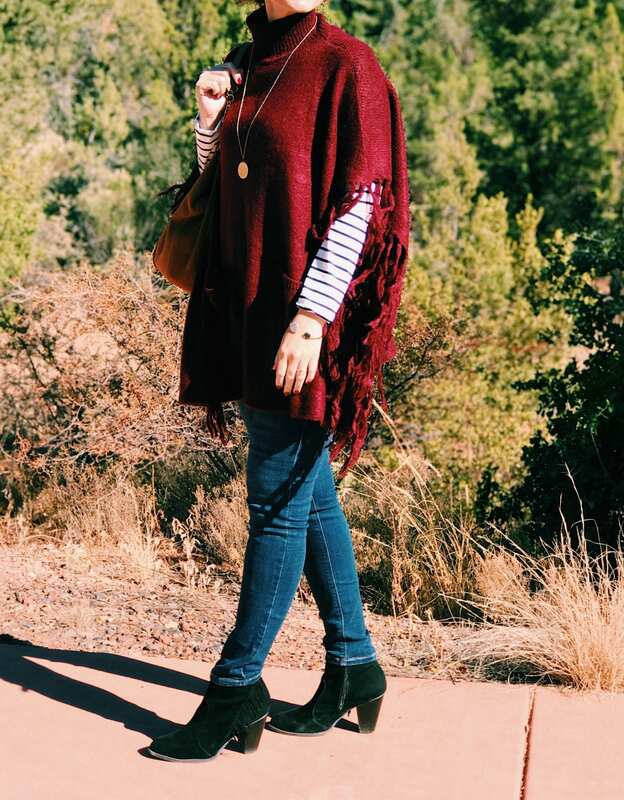 But, with Amazon Prime to the rescue, I ordered this super cute Steve Madden poncho! This is the perfect Thanksgiving outfit. It’s super comfortable. I can take the poncho off if I get too hot. 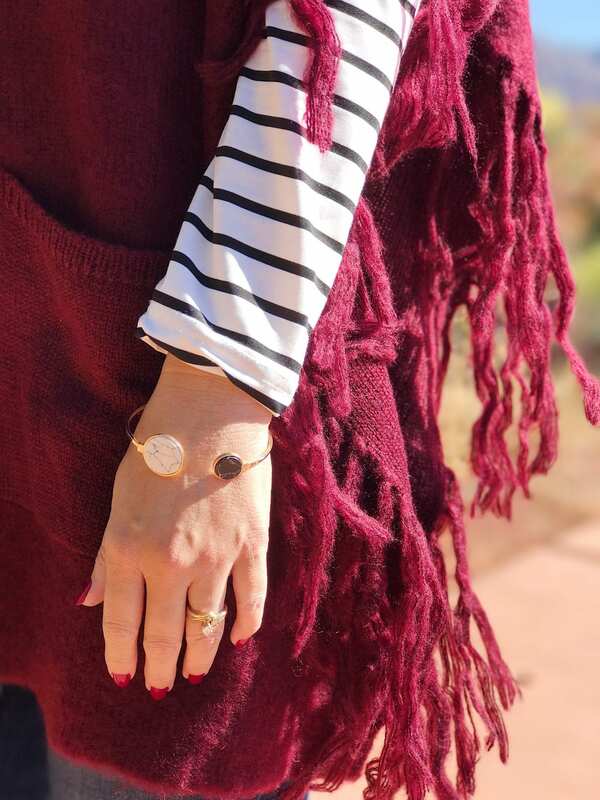 Plus, the burgundy color is beautiful for this time of year. Another bonus this outfit has for Thanksgiving, is I’m wearing my pull on legging jeans. The waist has no zipper or buttons! They’re from Lee and I’ve had them for a couple of years. They have the perfect amount of stretch in the waist and thigh area. This poncho is hand wash only, so keep that in mind if you decide to order it. It’s also one size fits all, features a turtleneck design and has two pockets in the front. My favorite part is the fringe on the sleeves. 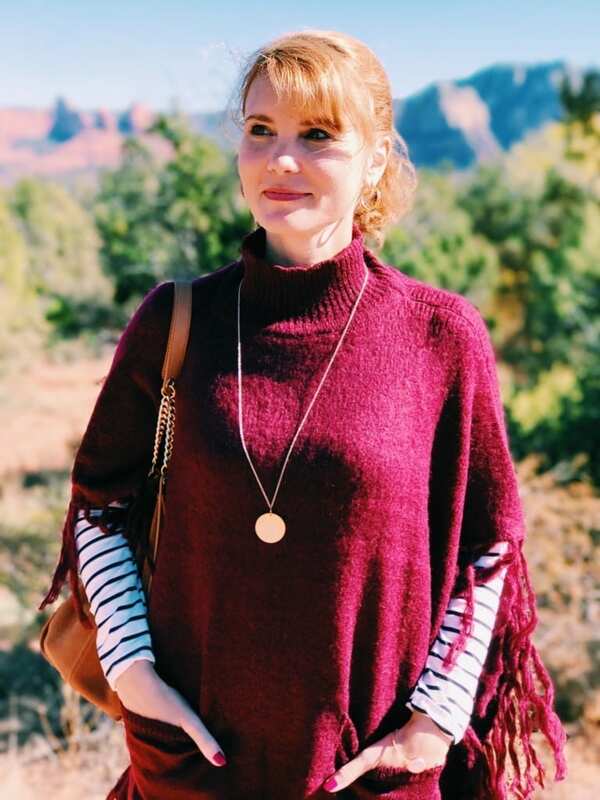 The price for this poncho keeps changing, but I’ve seen it as low as $18, marked down from $49. Stay tuned for some Black Friday and Cyber Monday Deals on fashion items I’ll be sharing with you soon!